Unlike the pomegranate and apricot, grapes occupy no unique place in Armenian lore. But they bring every bit as much joy to the Armenian palate. How can that be? Armenian grapes are known for their special sweetness. 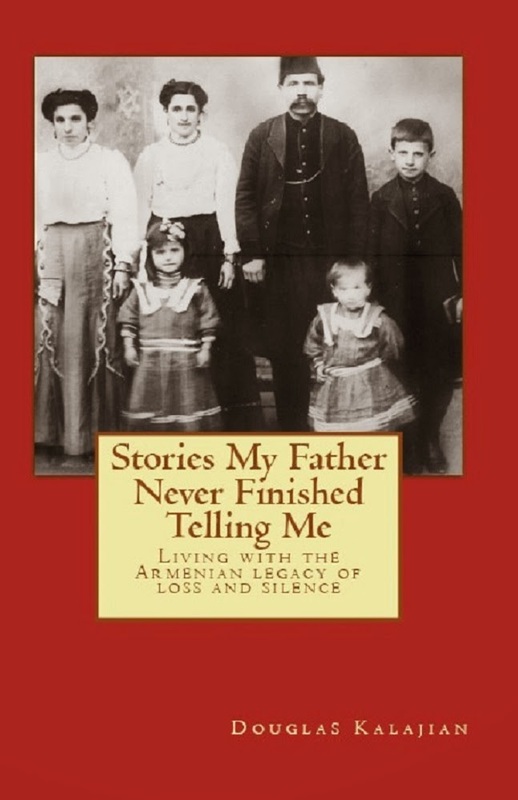 If you know Armenians, no further explanation is necessary! 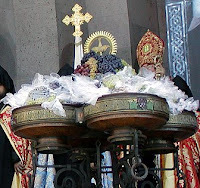 We've never eaten real Armenian grapes, but all grapes taste a little sweeter this month as Armenian churches around the world celebrate the Blessing of the Grapes along with the Feast of the Assumption. This is one of the big days on the Armenian religious calendar, marking the Holy Mother's assumption into heaven. There's nothing about grapes in the Biblical version, but the feast coincides closely with the first grape harvest of the year. So, the Armenian pagan tradition of offering the first crop to the goddess Anahid was adopted and transformed by the early church. The old-timers really didn't eat grapes before the blessing, although that's tradition and not a religious prohibition. Luckily, we're not old-timers, so we snack on grapes year-round. I brought home a particularly alluring basket of plump, red "seedless" grapes a couple of weeks ago without even noticing that they were shipped by a noted Armenian grower from California. Robyn took one bite and protested: "They have seeds!" Some people take things so literally. 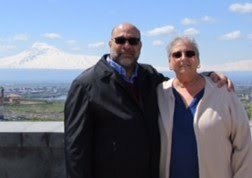 Hi, I am so glad that I stumbled unto your blog.You are doing a great service to Armenians and food lovers. I will read every post and for sure will enjoy the food of my heritage. Good luck, and "Bari Akhorjak"
I'm so glad you found this blog! Just so you know, there is a story coming soon about "Hye Tea"; hope you'll enjoy it.Feel free to tell others about the Armenian Kitchen.